Meru Greens co-founder Rosemary Muthomi recently visited Seattle. If produce in international grocery stores came from small, East African farms instead of big corporate ones, she wonders, how might that impact rural poverty in Kenya? It all started with green beans — a durable vegetable, quick to grow and well-suited for the task of convincing rural subsistence farmers to try a new crop. It’s a crop Rosemary Muthomi hoped might one day connect farms in Kenya to lucrative international markets. Imagine if the produce in international grocery stores came from small, East African farms instead of big corporate ones. How would it impact rural poverty if Kenyan subsistence farmers had fair access to the global market? This vision is what motivates Muthomi and her husband, Gerald Muthomi. They co-founded Meru Greens Horticulture, a company that offers continuous training to Kenyan farmers in agricultural techniques and supply-chain management, which ultimately helps subsistence farmers develop cash crops. 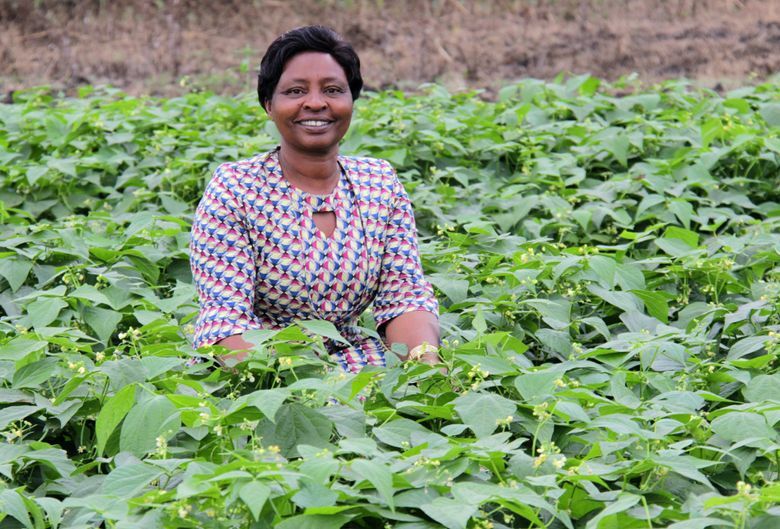 They started with local markets, but from the beginning, shipping Kenyan-grown green beans to high-paying foreign customers was the Holy Grail. “If they (farmers) are just growing maize, and a lot of other people are, too, and it all ripens at the same time so they may or may not be able to sell it for a good price,” says Rick Beckett, CEO of Global Partnerships, who visited Muthomi’s operations in person. He says diverse and alternating crops increase yields and profits. But Meru Greens doesn’t stop at green beans and crop diversification. It also offers training in irrigation, fertilizers use, best-seed practices, pest control and how-tos for harvesting produce without damaging it. What’s more, Meru Greens safely transports produce from the farm to its own processing and packaging plants. Muthomi explains that Kenyan roads can leave delicate mangos, avocados, bananas and papayas bruised and “unappealing” if not transported carefully. Costs for training and additional services are built into Meru Green’s sales margin. It’s a pretty impressive operation, one that now works with 10,000 farmers, employs almost 1,000 people and, according to Muthomi’s calculations, can raise a farmer’s net profits from $60 per crop cycle to $320. But it all started back in 1996 when the Muthomis — then both working in agriculture for the Kenyan government — bonded over shared frustrations. Rosemary Muthomi says they too often saw good crops fail to get to the right markets, or receptive markets turn away damaged produce. “We want to expose them (farmers) to the possibility of commercial opportunities in agribusiness … and enable them to enrich this potential and translate it to incomes,” she says, explaining those increased incomes support education and reduce food insecurity. So, the couple left the government for commercial agriculture in 2003. It took more than a decade before they secured their first foreign, green-bean customer. Today you can find Meru Greens green beans in French and German grocery stores. Having reached their initial goal, the couple are setting their sights on a new objective: They want to expand their farmer base from 10,000 to 35,000 by 2020. And they’re hoping Seattle-based nonprofit Global Partnerships — which offers loans to social enterprises around the world — can help. Global Partnerships has recently signed a letter of intent with Meru Greens and is in the process of finalizing the loan. But no matter how big her company becomes, Rosemary Muthomi says it’s a love of growing things, nurtured while harvesting maize alongside her mother, that keeps her motivated. And thanks to her work, there’s many more of those to visit in Kenya today.